The Chemistry Department is housed in the Jeppson Laboratory (completed in 1969) and in the Arthur M. Sackler Sciences Center (built in 1984). The Sackler Sciences Center (24,000 square feet) connects Jeppson and the newly renovated (2005) Physics, Mathematics and Computer Science Building. Jeppson contains approximately 27,000 square feet of floor space devoted to research laboratories and undergraduate teaching laboratories as well as lecture and seminar rooms and department offices. In September of 1984, Jeppson became part of the Arthur M. Sackler Sciences Center. The new facilities, constructed at a cost of $8 million, house research and teaching laboratories, classrooms, seminar rooms, and a 5,000 square foot science library. 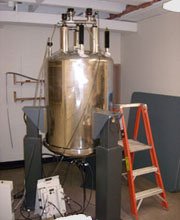 Most of the equipment is used for both research and teaching. All faculty, post-docs, and graduate students have access to the instrumentation as do undergraduate students involved in faculty-sponsored independent research projects. In addition, advanced undergraduate courses utilize many of these instruments. The Department encourages undergraduates who have taken at least Introductory and Organic Chemistry courses to participate with faculty and graduate students in performing original research.